"The dialogue of Patriarch Bartholomew and Pope Francis is not a 'surrender' or 'submission' of Orthodoxy. 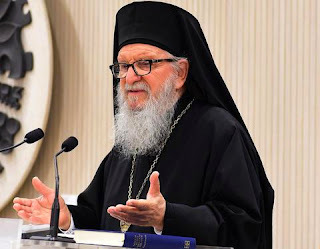 Rather, it enhances the possibility of cooperation and seeking solutions to immediate problems related to poverty, violence (terrorism) and the youth," said Archbishop Demetrios of America, who participated in the meetings and religious ceremonies held at the Patriarchate, during the recent visit to Constantinople of the head of the Roman Catholic Church. "They are things that are obvious and need no special wisdom. First, such meetings foster communication. And when this happens, dialogue automatically increases. And this is the first serious impact of the meeting. It also increases the opportunities for cooperation to address broader issues. Let me give an example: The Pope said - and the Patriarch is exactly on the same line - that we have a big issue: poverty with all its consequences. And poverty in the widest sense: deprivation of capabilities, oppressive situations, etc. Therefore, poverty is an issue on which we must work. Second, is the issue called violence in the world and is expressed in extreme forms, even from religious communities. And the third is the youth. We do not want to see a youth that will have no future." Archbishop Demetrios noted that "these issues, then, can be specifically addressed in terms of dealing and action when there is an increased cooperation." "They have nothing to do with and there is no connection to the fears of some extreme people of a 'surrender' or 'submission' of Orthodoxy. None of these things. Dialogue means an opportunity to cooperate to find solutions, efficiently, to immediate problems, social and international, relating to poverty, violence and the youth and which do not affect doctrine, because there are very clear positions. It does not consist of a 'surrender' or 'submission' of Orthodoxy," he said. More so, the Archbishop said that "the meeting was held in a spirit of cordiality" and he noted: "The Pope is a man who shows humility, he does not show arrogance. While he is clear in some very strong ideas, on the other hand, he is a man who is very open to collaboration. This communication has increased the ease of communication with the Patriarch. That is, they are both comfortable in discussions, which is not easy to do. Therefore, this is a great advantage, because many times this comfort of communication solves problems that are not easily solved. They can deal with something for years and when they say 'look, close the issue' it is closed, because there is such a developed communication that it helps immensely in addressing issues for which there are needs. Christianity is the religion par excellence of love, care about people, and we want in any way to have greater possibilities in this direction."